Home > Blog > Save your Wardrobe from Fall Mess!! Save your Wardrobe from Fall Mess!! We all spend hours watching videos about how to organize our closets, but we never apply those tips. Actually, i used to find these tutos very demanding and not applicable. However, this video was really helpful. I didn’t have to buy new containers or redesign my wardrobe. Rather than this, I learned the new folding ways proposed. When my husband came back, he was chocked by the amazing results. Actually all the proposed folding techniques saved me space to put things i was hiding in boxes. The clothes stay straight and you don’t need to iron them later. I encourage you to watch the tips in the video and share it with your friends. Using Onion Juice can Save Your Hair Life, check this out! 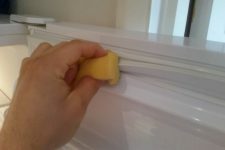 Are you Sure your Refrigerator Door Gasket is Clean?